A week ago I said I had probably had my last beach day, what with the rain starting and all. I was wrong. While we've had some pretty wet spells lately, we were lucky today to have a full day of sunshine - perfect beach weather. As I was splashing around in the ocean it occurred to me that I had never really talked about the islands, which is a shame since its one of the best day trips you can make from Conakry, one I have made many times. Conakry is a long skinny peninsula jutting out into the Atlantic. At the end of the peninsula and a little ways out there are three islands that look like this: ( o ). The long skinny curvy islands are Kassa and Fotoba/Tamara, and the little round one in the middle is called Roum. Roum is where we go on weekends with the embassy boat. Did I mention the embassy has a boat? It's for emergency purposes, in case we ever need to evacuate but the roads are closed and the airport is shut down. But a boat isn't really something you can keep on a shelf until you need it, so we keep it in good order with beach trips during the dry season. 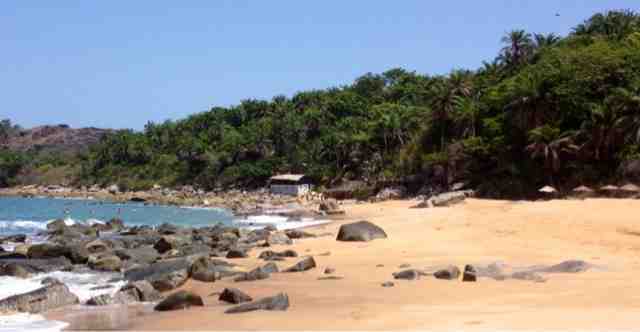 Most of Guinea's coast is rocks and mangroves, and that goes for Conakry as well. There are some small sandy beaches in Conakry proper, but so unsanitary as to be pointless to visit. Roum is different. It has some nice clean stretches of beach, far enough away from town to be out of its trash and sewage. There's a little restaurant that serves tasty seafood and chicken, as long as you order several hours in advance. And that's about it really. Sand, water, palm trees, fish, and sunshine (weather permitting). It wouldn't win any prizes against other beaches in the world, but it feels a world away from the chaos of Conakry, which is all I'm looking for.